London Live, video by Luke Blackall. Read the full story. Creative Boom, article by Emily Gosling. Read the full story. The Bookseller, article by Charlotte Eyre. Read the full story. Oliver Jeffers’ next book, due for release by HarperCollins Children’s Books in September, will be a modern-day fable for readers of all ages. The Fate of Fausto, created using traditional lithographic printmaking techniques at a Paris fine-art printing house, is about a man called Fausto who wants to own everything he sees. According to HarperCollins Jeffers has sold more than 12 million books worldwide and his works have been translated into 45 languages. He has won prizes including the Nestlé Children’s Book Prize Gold Award, the Blue Peter Book of the Year, the Irish Children’s Book of the Year. He is represented by Paul Moreton of Bell Lomax Moreton. Oliver teamed up with Apple Education for Earth Day this year, encouraging students to draw the world the way they want to see it. Find more about the campaign here. The Working Mind and Drawing Hand of Oliver Jeffers as recommended reading, article by Esther Oh. Read the full story in Communication Arts Magazine. GQ, Read the full story here. Oliver Jeffers is an Northern Irish artist, designer, illustrator and writer. Jeffers is most well-known for his picture books, especially Here We Are, his most recent publication. 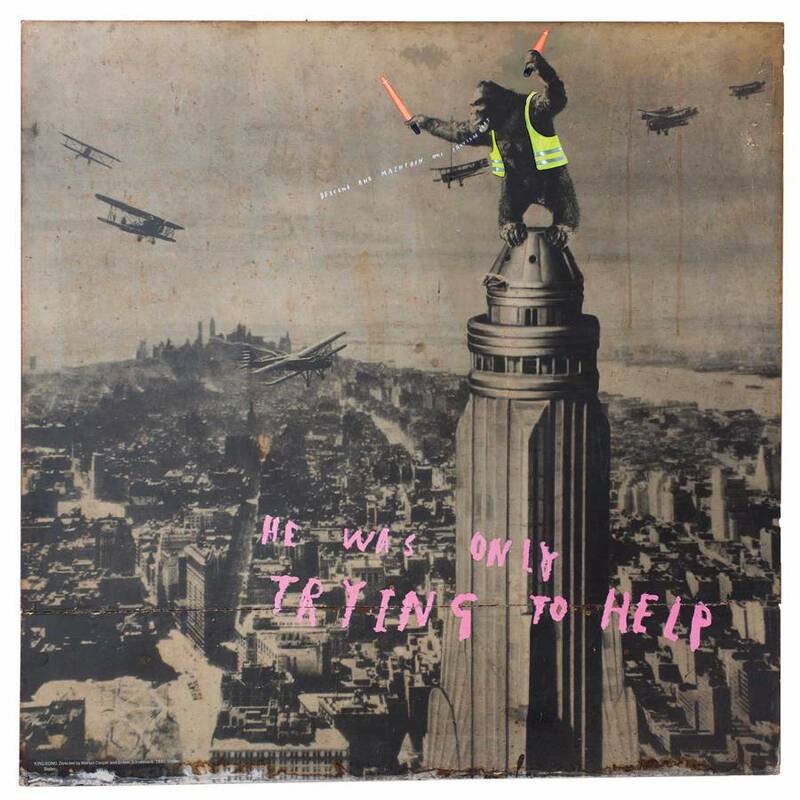 The work he produces varies from figurative painting, collage, installation and illustration and he is just about to launch, in April, his largest UK solo exhibition to date at the Lazinc Gallery, called Observations On Modern Life. Observations On Modern Life is a showcase of approximately 50 of Jeffers' sculptural and collage work from the past decade. The exhibition will portray his engagement with contemporary life, presenting both the manic speed in which we live and society’s rapid consumption of information. ARTNEWS, article by Claire Selvin. Read the full story. The New York Times, article by Maria Russo. Read the full story. 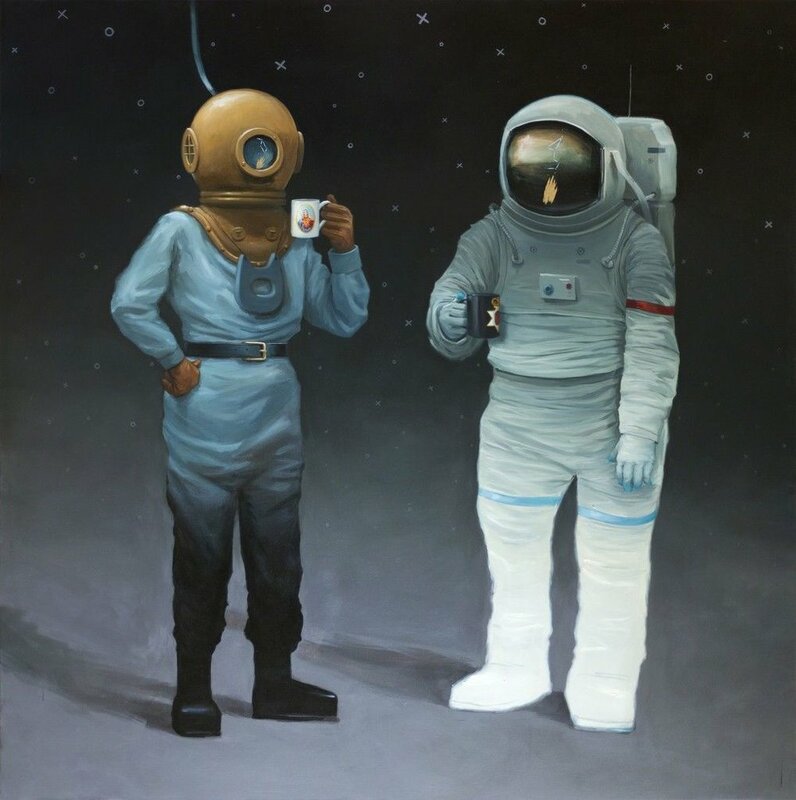 The artist Oliver Jeffers, born in Northern Ireland and living and working now in Brooklyn, always has a lot going on. So it makes sense that his studio is in the Invisible Dog Art Center, a converted factory that is home to art exhibitions, performances and public art events, as well as studio space for several dozen artists. 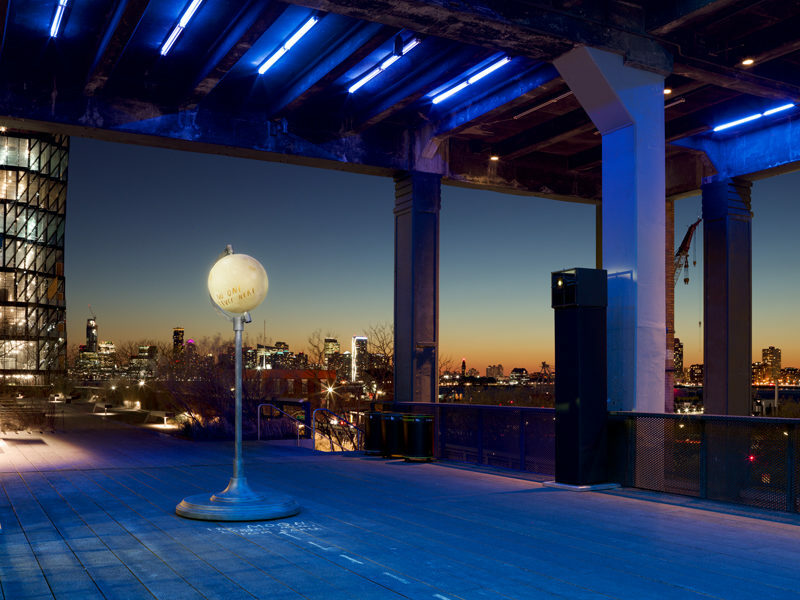 With Jeffers’s recent public installation, “The Moon, the Earth and Us,” on Manhattan’s High Line, we stopped in to his studio to find out how he makes it all happen. These are edited excerpts from our conversation. hat’s your favorite thing about your space? You also seem to be a fan of to-do lists. Your installation on the High Line, “The Moon, the Earth and Us,” had two globes representing the Earth and the Moon. And your latest picture book, too, “Here We Are,” is full of globes and maps. How do you see the relationship between your fine art work and your picture books? You seem to bring the two together as seamlessly as any artist working today. Artsy, article by Jacqui Palumbo. Read the full story. Jeffers, who hails from Belfast and currently lives and works in Brooklyn, would go on to publish the New York Times bestselling picture book Here We Are: Notes For Living on Planet Earth in the fall of 2017, which he has called “a guidebook of sorts about our planet” and “the basic principles of humanity.” Around the same time, he began translating some of the same ideas into a series of oil paintings, “For All We Know” (2018), and later, a public installation, The Moon, the Earth, and Us (2019), both of which are now on view in New York. Jeffers was schooled formally as a painter and believed that painting would be his path, before discovering his talent for making picture books. He’s since authored and illustrated more than a dozen books, which celebrate curiosity, adventure, and empathy, and have been avidly read by children and adults alike. “Rather than separating or taking a tangent [in my] career, I just decided to do both things until someone told me otherwise—and nobody ever did,” Jeffers said. In Jeffers’s latest book, exhibition, and installation, the commonalities have never been more direct, each exploring one’s place in the universe and our responsibility to the world we inhabit. 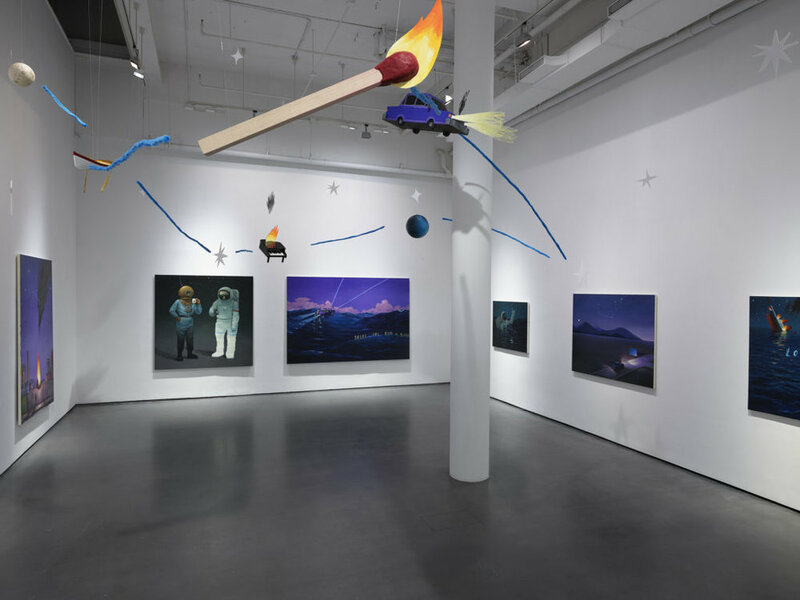 In the nocturnal, cosmic scenes of “For All We Know,” on view at Bryce Wolkowitz Gallery until February 16th, astronauts explore the dark skies and deep seas—two expanses of unimaginable depth and mystery. Symbolism abounds in the form of matchsticks, pianos, and ships set aflame, against the backdrop of glimmering constellations and ebbing tides. The series began with Jeffers’s fascination with star patterns, and the idea that the tradition of naming constellations—which has been handed down since ancient Greece—was ultimately a form of storytelling. “It was a very early attempt to make sense out of chaos,” he offered. “[It was] a way to understand their place in the world.” Then, in August 2017, when Jeffers drove to Tennessee to experience the totality of the Great American Eclipse, his own understanding of Earth’s place in the solar system shifted. “Seeing two objects line up against each other with your own eyes…is very different from understanding the numbers and being told what the distances are,” he recalled. That sense of perspective is an undercurrent through both Here We Are and “For All We Know.” The constellations that serve as a guide for Jeffers’s younger readers in his book appear in his paintings, too, entreating older viewers to consider the mysteries of the ever-expanding cosmos and their role within it. 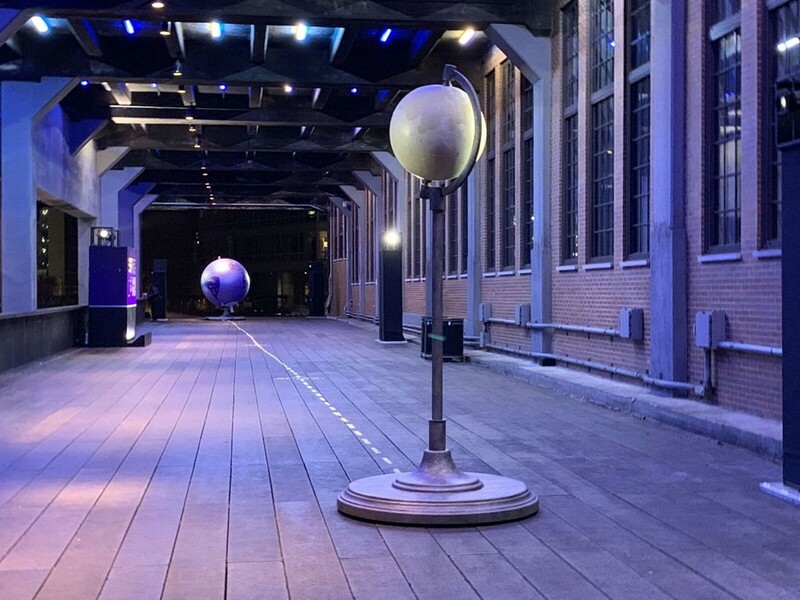 Perspective also inspired Jeffers’s current installation on New York City’s High Line (between West 15th and 16th Streets), The Moon, the Earth, and Us, which considers the relationship between Earth and its lunar companion. Jeffers sought to capture this phenomenon, called the overview effect, in the installation, which features to-scale models of Earth and the moon. Passersby can walk from one globe to the other, and as they approach the moon, they will see hand-painted text reading “No one lives here”; as they walk toward Earth, “People live here” will come into view. Through the project, Jeffers asks viewers to consider the artificiality of borders: The further away that one gets from their home city or country, the less it matters where one comes from. When in space, nationalism means nothing. Despite making work for different audiences, Jeffers doesn’t tailor his projects to children or adults. “It’s all coming from the same place,” he noted. In Here We Are, he had to follow a more traditional narrative structure; in his paintings, he could address the idea of belonging in the universe in “a bit more abstract and meandering” way, he explained; and in his installation, he focused on one particular aspect of his larger message. While Jeffers wants viewers to enjoy his work and to “get the sense of playfulness” he imbues in each project, he said, he also wishes to use his work to catalyze a paradigm shift in how they look at the world and their own lives. Watch the full video on BRIC TV. Fine artist, illustrator, and author Oliver Jeffers has been telling stories through images for almost two decades. Take a peek inside his studio as Jeffers tells us about his artistic practice, how being a new parent informs his work, and the crossover between his fine art and picture book work. Whitewall, review by Pearl Fontaine. Read the full story. NPR’s Weekend Edition Sunday, interview by Jeff Lunden. Listen to the full story. Belfast-born Oliver Jeffers paints, writes and illustrates children's books. 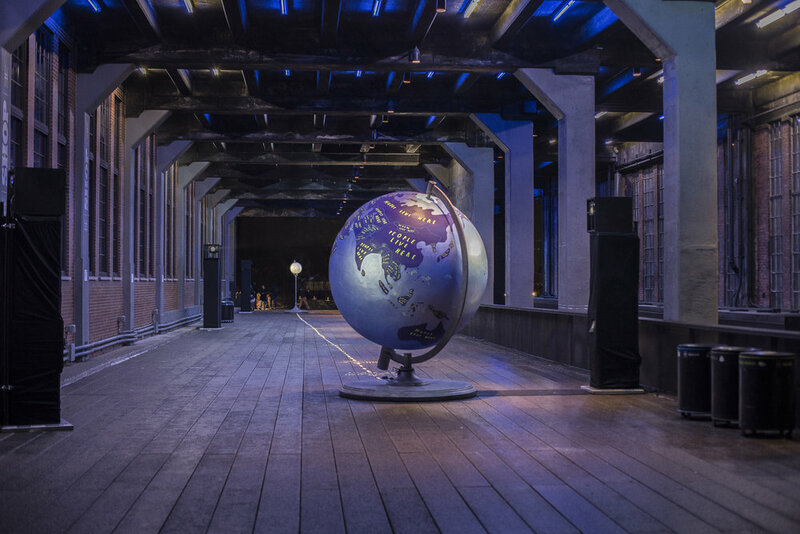 He recently premiered a new art installation on the High Line in New York City called "The Moon, The Earth and Us." Oliver Jeffers is an author of children's picture books and an artist. His latest installation is called "The Moon, The Earth And Us." It's in New York on the High Line - a park built on an old, elevated railroad. And since Jeffers' work appeals to kids and adults, reporter Jeff Lunden brought two children along to meet the Belfast-born artist. JEFF LUNDEN, BYLINE: On a dank, windy, January afternoon, we met Oliver Jeffers to get a tour of his new installation, which consists of two scale-sized globes of the Earth and moon separated by a scale-length dotted line between them. ELEANOR: My name's Eleanor. I'm 5 years old. HENRY: My name is Henry, and I'm 9 years old. OLIVER JEFFERS: Hello, Henry. I'm Oliver - 41 years old. LUNDEN: Jeffers told Eleanor and Henry Ying and me that his work was inspired, in part, by Apollo 8, which flew around the moon about 50 years ago. JEFFERS: And it was the very first time the planet had been photographed in its entirety. And it completely changed people's outlook on Earth. LUNDEN: So Jeffers wanted to recreate that perspective for people visiting the park today. 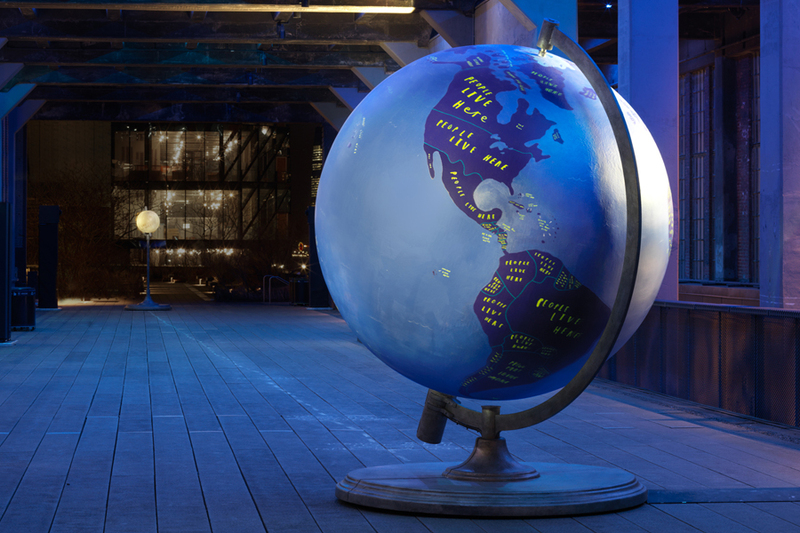 On one side of the installation is a globe representing the Earth - eight feet in diameter, made of foam, steel and acrylic - all hand-painted by Jeffers. JEFFERS: This thing is actually spinning but very, very, very slowly. LUNDEN: As you get closer, you see writing all over the globe. 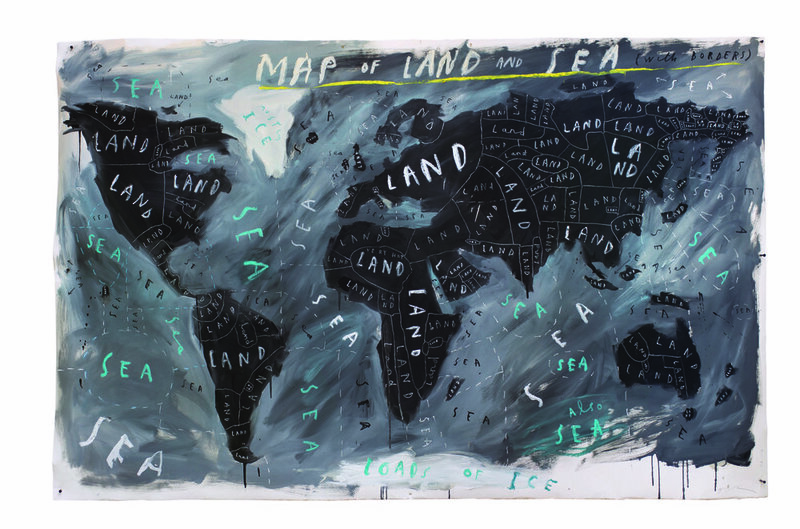 JEFFERS: Every single country that exists is drawn in here with all of the borders. And inside every single one, it says, people live here. ELEANOR: Except for the bottom. JEFFERS: ...Because that's the South Pole. LUNDEN: We walked around the globe. JEFFERS: All of South America, all of North America, all the Caribbean islands, it just says over and over and over again, people live here. You know, even this border right now that's been very contested in the news at the minute between the U.S.A and Mexico, you know who lives on either side of that border? LUNDEN: Then it was time to blast off - figuratively - into space. Jeffers pointed to a spot on the globe. JEFFERS: Cape Canaveral, I think, the Apollo mission took off from. And imagine you're a little astronaut. You come flying out of the Earth's atmosphere. LUNDEN: And the two little astronauts followed Jeffers along a dotted, yellow line with marks saying 10,000 miles, 25,000 miles, 60,000 miles. At each mark, we turned back to look at the Earth. JEFFERS: It's getting smaller and smaller. You're probably feeling very alone right now in your spaceship. It's a long way. JEFFERS: I hope you brought a book or, at least, some sandwiches. So here we are. This is about halfway. And we're 120,000 miles from Earth. JEFFERS: So right now we're halfway between the moon and the Earth. Let's keep going. ELEANOR: No one lives here. JEFFERS: No one lives here. And that's it. LUNDEN: While there's a political component to Jeffers' vision, he also means for his work to be playful, which Eleanor and Henry totally got. JEFFERS: I love that these guys right away got the idea to play, to pretend you're an astronaut, pretend you've got a spaceship and actually traverse this and what it feels like to have actually venture that far away from our planet and then do a loop around the moon and come back. And I'm hoping that people do that and enjoy that experience and consider what it is like to think of our home as just this tiny thing floating in the middle of nowhere and with a hopeful sense of unity that that might bring. LUNDEN: Both Henry and Eleanor Ying certainly enjoyed experiencing Oliver Jeffers' "The Moon, The Earth And Us." As they got one of his picture books signed, Henry, age 9, looked back at the globe of the Earth and observed. HENRY: Last time, it was ocean. Now I see Africa. JEFFERS: Yep - slowly rotating. LUNDEN: The installation will be displayed on the High Line in Manhattan until February 14. For NPR News, I'm Jeff Lunden in New York. Citylab, article by Laura Feinstein. Read the full story. Oliver Jeffers’s new installation, The Moon, The Earth and Us pays tribute to the most famous photograph taken of earth and questions our place in the universe. It’s an auspicious week for those looking to the heavens. Last Sunday, much of the world was treated to a rare, crimson-hued lunar eclipse, known as the Super Wolf Blood Moon, and starting today and lasting through February 14th, visitors to Manhattan’s High Line will be able to actually “meet” the moon itself—care of Oliver Jeffers’ installation, The Moon, The Earth and Us. Conceptualized to spark dialogue on the significance—or lack of significance—of man-made borders, replicas of the earth, and moon made of steel, foam, and coated in acrylic, will transform the Chelsea Market Passage of the High Line between 15th and 16th street into a micro-solar system. The Earth, built to scale at eight feet in diameter, and The Moon at two, will both be mounted at a height of 10 feet, roughly a city block apart, with the earth positioned to rotate slowly, almost imperceptibly, on its axis. Inside each man-made border on this faux-earth will read the simple inscription “People Live Here,” while The Moon’s surface will state the obvious: “No One Lives Here.” Through this ambitious lens, Jeffers seeks to underline just how arbitrary man-made constructs like borders and walls truly are when juxtaposed with the magnificent vastness of space. The installation is also an exploration of the shift in perspective that occurs when our planet is seen from a significant distance, the “Overview Effect” normally reserved for astronauts and space satellites. The most famous example is the "Earthrise" photo taken by astronaut Bill Anders from the Apollo 8 mission on Christmas Eve in 1968 which just had its 50th anniversary last December. The first photo to capture the earth in its entirety, it briefly lassoed the global imagination, enabling Americans to put aside the horrors of the Vietnam War to contemplate the cosmic power of the universe. “We'd seen our planet from above with the help of satellite imagery, but Apollo 8's crew were the first to witness the full globe of Earth rise up in the distance, providing a speck of dazzling color against the alien lunar landscape,” astronaut Jim Lovell said of the view during a live television broadcast. “The vast loneliness is awe-inspiring and it makes you realize just what you have back there on Earth." Jeffers, a prolific illustrator and children’s book author from Northern Ireland, has made the globe and planetary travel something of a motif in his work, which includes his illustrated books Here We Are: Notes for Living on the Planet Earth and How to Capture a Star, a children’s story about the transformative power of exploration in space and on earth. “I’ve always created maps and globes to make political comments,” said the artist, who has often found inspiration Buckminster Fuller’s seminal work Operating Manual For Spaceship Earth, a series of essays on the challenges and idealistic solutions of man, as well as his own upbringing in Northern Ireland. “When I was researching what astronauts noticed about looking at earth from a distance of the moon, I recognized the same language I would often use when describing Northern Ireland from the perspective of New York,” he said, referencing his attempts to explain Britain's complex geopolitical troubles to American audiences. “But when you remove yourself, when you get enough distance, you see the earth entirely differently.” And, he found, it takes away daily life's power to inflict emotional distress. During the eclipse, Jeffers experienced the same feeling of repose. “That sense of perspective you get when the moon is blocking the sun, you feel infinitesimally small and are left with the realization of just how isolated we are.” The installation, coincidentally, went up just a day after one of the largest full moons of the year. This installation will be Jeffers’s most structurally ambitious project to date, realized with the help of set designer Jason Ardizzone-West, who conceptualized the schematics and renderings, along with Showman Fabricators, and filmmaker Guy Reid, of the Planetary Collective. This installation is Jeffers’s second project to appear in New York this month. “For All We Know”, a series of paintings and illustrations with a cosmic-bent, opened at the Bryce Wolkowitz Gallery in Chelsea last Thursday. These two works are part of a larger project that soon may have a more immersive aspect but, for now, the artist’s lips are sealed. Cultured Magazine, article by Leah Rosenzweig. Read the full story. Oliver Jeffers is still talking about the total solar eclipse of 2017. You remember—the once-in-a-lifetime celestial event which spanned the entire contiguous United States. The national spectacle that brought us a slew of marriage proposals, live tweets, and our very own president peering into a partially eclipsed sun. Visibility of the shrouding varied, as the path of totality covered only 16 percent of the country. I, for one, could not see anything from my hilly Los Angeles viewing place. But Jeffers, who traveled with his family to the path of totality in Tennessee, saw everything—and nothing. “It’s like a black hole in the sky,” Jeffers says. “There’s magnitude in watching something so vast. In a total eclipse, you get a split second of new perspective. You feel infinitesimal.” Though with this last total eclipse, Jeffers says, it was more than a split second. And as the disk of the sun remained veiled by the moon, he began to feel smaller and smaller. Perhaps best known for his illustrated children’s books, Jeffers has been intimately exploring themes of earth, space, galactic relativity and the unknown for some time now. But becoming a father in 2015, he admits, has caused him to do so with renewed urgency. “My son doesn’t know anything yet, so it’s up to me and his mother and his entire community to teach him absolutely everything. Both the gravity and the possibility in that were sort of terrifying and awe-inspiring at the same time.” In 2017, Jeffers published Here We Are: Notes for Living on Planet Earth. Dedicated to his son and much like his artwork, the book serves as an exploration of the unexplored. Constellations serve as connective tissue between the earthly and the celestial, while human figures are scaled dramatically against boundless purple skies. In his latest series of oil paintings, many of which are drafted using an iPad Pro, Jeffers plays with crisis of identity at home—such as in his depictions of his native Belfast—and anxious wanderlust for a universe we’ll likely never know. The iPad acts as a mapping tool for imagining works before they’re realized in paint. Atop a high-resolution image of old book bindings arranged into a makeshift canvas, Jeffers shows me how he sketched a mobile-like pattern. The goal is to plot the whole painting so that nothing falls between the cracks. Otherwise, Jeffers tells me, it becomes difficult to paint. With his first New York solo exhibition at Bryce Wolkowitz Gallery in Chelsea on view through February 16, running in conjunction with his High Line debut which launches tonight, Jeffers approaches the earth and its solar system from a place of genuine curiosity. For All We Know, at Wolkowtiz, is about representing different perspectives and telling stories—stories of self and one’s place in the galaxy, stories that come to us through star gazes, through eclipses. Similarly, the High Line engages perspective through the lens of borders both galactic and earthly. In The Moon, the Earth and Us, Jeffers explores the relationship between the Earth and its moon with two massive globes displayed at 15th and 16th streets. The surface of the moon reads, “No One Lives Here,” while each country on the Earth features the words, “People Live Here.” Nearly 50 years since the American moon landing, Jeffers intimates that the lunar body is still largely a thing of mystery, especially to us Americans who have trouble imagining a world beyond our own national boundaries. It’s a reminder that everyone matters, and as Jeffers tells me, that we’re “part of a greater system,” that it’s not just “you, your life, and your country,” that we are at once crucial and infinitesimal. The Wall Street Journal, article by Lane Florsheim.